A Spanish air force C295. Despite the Alenia C-27J being selected for the RAAF’s battlefield airlifter requirement earlier this month, Airbus Military CEO Domingo Urena has called for transparency over the decision and for an open competition in which it can offer the C295. “The only thing we claim is, ‘give us the right to compete’,” Urena told journalists in France this week when asked for a response on the C-27J decision. Defence Minister Stephen Smith announced the selection of the C-27J during the RAAF’s Air Power Conference on May 10. Ten C-27Js will be ordered through the US FMS process, while a separate maintenance and support agreement will be reached with Alenia. 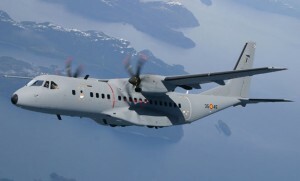 Minister Smith put the value of the acquisition at $1.4 billion, a figure almost double what Airbus Military has said a similar acquisition of the C295 would cost. Urena also said Airbus Military had yet to receive a response from the Australian government on its unsolicited proposal to convert a sixth A330 into a KC-30 for the RAAF with Qantas Defence at Brisbane, which would keep the conversion line open ahead of potential future work for other A330 MRTT customers. “This offer is still on the table, but unfortunately by the end of the month we [begin to] shut down the Qantas Defence [conversion activity], we are going to finalise how we are going to finish aircraft number five, and then unfortunately those capabilities are going to be lost,” he said. Urena’s comments come two weeks after Airbus Military issued an unusually harsh response to Australia’s decision to order the C-27J, in particular disputing the Defence Minister’s public statement that the C-27J was selected after a competition with the C295.